Coming home with a brand new Suzuki APV van after having a sumptuous meal at an SM Foodcourt, without even paying for the van, may be beyond one's reason or might even be shocking to many. But what if I tell you, you could be that very person, or wait it might be me. 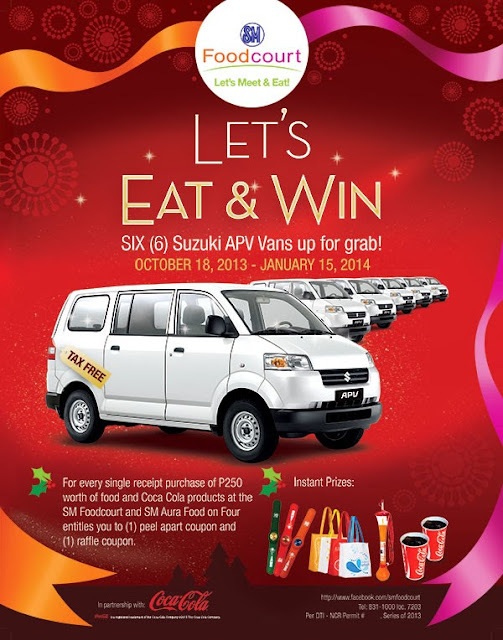 Starting October 18, 2013 until January 19, 2014, SM Supermalls will open their promotion for SM Foodcourt's LET'S EAT AND WIN! Considered to be SM Foodcourt's biggest promotion for this year, they will be raffling off 6 Suzuki APV vans in the raffle draws, TAX FREE and more instant prizes. 1. Simply buy your meal costing P250 on a single receipt with any Coca-Cola product at participating SM Foodcourt tenants. 2. The customer's receipt is equivalent to a PROMO peel-apart card with a raffle coupon. You may get instant prizes or Try Again message. 3. Then fill up the coupon with the necessary details like customers complete name, home address, telephone number, email address, customer signature, Foodcourt branch & amount purchased. 4. Customers must drop his/her entry at the designated drop box located at the Foodcourt area redemption booth. Instant Prizes include snap watches, yard cups, placemats, eco bags, free upsize on any Coca - Cola product and free Coke in cans. Entries must be up on November 19, 2013 at the end of mall operating hour. There will be two (2) winners for Luzon entries and one (1) winner for Visayas and Mindanao entries. Raffle Draw will be on the following dates, so better take note of this date as well. January 24, 2014 – the last and final three (3) cars will be drawn at SM NORTH EDSA. All raffle entries from Luzon, Visayas and Mindanao should be at SM NORTH EDSA on or before January 23, 2014 at the end of mall operating hours. Note: one tambiolo will be used for the combine entries of Luzon, Visayas & Mindanao. * All entries submitted and received after the first draw cut off will be included in the 2nd and final draw. * Non-winning entries of the 1st draw will no longer be included in the 2nd and final draw. * There will be five (5) winners from Luzon, Visayas & Mindanao entries and one (1) guaranteed winner from Visayas and Mindanao for a total of six (6) lucky winners for the whole duration of the promo. * The 20% tax for prizes exceeding Php10,000 shall be shouldered by SM Supermalls, any other expenses incurred-- that may include the transfer expenses, shipment charges and unit registration shall be shouldered by the winner. * The raffle draw winners may only redeem their prize within sixty days (60) after notification, otherwise, prizes shall be forfeited in favor of SM Foodcourt and Shopping Center Management Corp. (SCMC) with prior DTI approval. * Customer may win only once on the raffle. *A DTI representative will be present during the raffle draws and the promo organizers decision is final and irrevocable with concurrence of DTI. * List of winners will be posted in all participating branches of SM Foodcourt, may be published in major newspaper, and an announcement at SM Facebook fan page. * Color of car may vary from what is shown in the collateral material of this promotion. * All prizes are not convertible to cash. * Promo is valid for dine-in and take-out orders only. * The promo is not valid with any other on-going promotions and discounts. * All employees of the participating sponsors, its advertising/media agencies; employees of SM Supermalls and its subsidiaries; employees of the promo agency; and their relatives up to the third civil degree of consanguinity or affinity are disqualified from joining the promo. So, see you at any SM Foodcourts and let's fill up with meals and bring home prizes. Make sure to mark your calendar starting October 18, 2013.